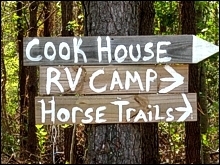 Sunset Stables offers approximately 13 miles of clean, cleared trails that extend through woodlands, swamps and farm land. It takes about 3 to 4 hours to complete the ride. It is good riding for beginner and experienced riders. It's a fun experience for the whole family. Cost for camping riders is $5 per horse per day. Cost for non-camping riders is $10 per horse per day. The trails are an enjoyable ride for young and old alike. Come experience a little piece of heaven right here in Eastern North Carolina.